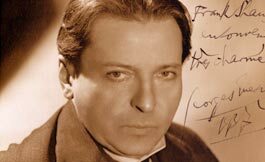 Enesco, Georges (real name, George Enescu), famous Romanian violinist, conductor, teacher, and composer; b. Liveni-Virnav, Aug. 19, 1881; d. Paris, May 4, 1955. He began to play the piano when he was 4, taking lessons with a Gypsy violinist, Nicolas Chioru, and began composing when he was 5; then studied with Caudella in Iasi. On Aug. 5, 1889, he made his formal debut as a violinist in Slánic, Moldavia. In the meantime, he had enrolled in the Conservatory of the Gesellschaft der Musikfreunde in Vienna (1888), where he studied violin with S. Bachrich, J. Grün, and J. Hellmesberger Jr.; piano with L. Ernst; harmony, counterpoint, and composition with R. Fuchs; chamber music with J. Hellmesberger Sr.; and music history with A. Prosnitz, winning 1st prizes in violin and harmony (1892). After his graduation (1894), he entered the Paris Conservatory, where he studied violin with Marsick and J. White, harmony with Dubois and Thomas, counterpoint with Gédalge, composition with Fauré and Massenet, and early music with Diémer, winning 2nd accessit for counterpoint and fugue (1897) and graduating with the premier prix for violin (1899). At the same time, he also studied cello, organ, and piano, attaining more than ordinary proficiency on each. On June 11, 1897, he presented in Paris a concert of his works, which attracted the attention of Colonne, who brought out the youthful composer's op.1, "Poème roumain," the next year. Enesco also launched his conducting career in Bucharest in 1898. In 1902 he first appeared as a violinist in Berlin and also organized a piano trio; in 1904 he formed a quartet. On March 8, 1903, he conducted the premiere of his 2 "Romanian Rhapsodies" in Bucharest, the first of which was to become his most celebrated work. He soon was appointed court violinist to the Queen of Romania. In 1912 he established an annual prize for Romanian composers, which was subsequently won by Jora, Enacovici, Golestan, Otescu, and others. In 1917 he founded the George Enescu symphony concerts in Ia&scedil;i. After the end of World War I, he made major tours as a violinist and conductor; he also taught violin in Paris, where his pupils included Menuhin, Grumiaux, Gitlis, and Ferras. He made his U.S. debut in the triple role of conductor, violinist, and composer with the Philadelphia Orchestra in N.Y. on Jan. 2, 1923; he returned to conduct the N.Y. Philharmonic on Jan. 28, 1937. He led several subsequent concerts with it with remarkable success; led it in 14 concerts in 1938, and also appeared twice as a violinist; he conducted 2 concerts at the N.Y. World's Fair in 1939. The outbreak of World War II found him in Romania, where he lived on his farm in Sinaia, near Bucharest. He visited N.Y. again in 1946 as a teacher. On Jan. 21, 1950, during the 60th anniversary season of his debut as a violinist, he gave a farewell concert with the N.Y. Philharmonic in the multiple capacity of violinist, pianist, conductor, and composer, in a program comprising Bach's Double Concerto (with Menuhin), a violin sonata (playing the piano part with Menuhin), and his 1st "Romanian Rhapsody" (conducting the orchestra). He then returned to Paris, where his last years were marked by near poverty and poor health. In July 1954 he suffered a stroke and remained an invalid for his remaining days. Although Enesco severed relations with his Communist homeland, the Romanian government paid homage to him for his varied accomplishments. His native village, a street in Bucharest, and the State Philharmonic of Bucharest were named in his honor. Periodical Enesco festivals and international performing competitions were established in Bucharest in 1958. Enesco had an extraordinary range of musical interests. His compositions include artistic stylizations of Romanian folk strains; while his style was neo-Romantic, he made occasional use of experimental devices, such as quarter tones in his opera, "Oedipe." He possessed a fabulous memory and was able to perform innumerable works without scores. He not only distinguished himself as a violinist and conductor, but he was also a fine pianist and a gifted teacher. (all published in Bucharest unless otherwise given): M. Costin, G. E. (1938); V. Cheorghiu, UN MUZICIAN GENIAL: G. E. (1944); F. Brulez, G. E. (1947); B. Gavoty, YEHUDI MENUHIN-G. E. (Geneva, 1955); A. Tudor, E. (1956); L. Voiculescu, G. E. I OPERA &Scedil;A OEDIP (1956); A. Tudor, G. E.: VIA&Tcedil;Â IN IMAGINI (1959; Fr. tr., 1961); G. E. ON THE 80TH ANNIVERSARY OF HIS BIRTH (1961); G. B&abreve;lan, G. E.: MESAJUL--ESTETICA (1962); idem, E. (1963; Ger. tr., 1964); F. Foni, N. Missir, M. Voicana, and E. Zottoviceanu, G. E. (1964); B. Kotlyarov, G. E. (Moscow, 1965); E. Ciomac, E. (1968); M. Voicana et al., eds., G. E.: MONOGRAFIE (2 vols., 1971); R. Draghici, G. E. (Bacau, 1973); M. Voicana, ed., ENESCIANA, I (1976; in Fr., Ger., and Eng. ); A Cosmovici, G. E. În LUMEA MUZICII &Scedil;I ÎN FAMILIE (1990); N. Malcolm, G. E.: HIS LIFE AND MUSIC (London, 1990); V. Cosma, G.E. : CRONICA UNEI VIE&Tcedil;I ZBUCIUMSTEI (1991); M. Brediceanu et al., CELEBRATING G. E.: A SYMPOSIUM (Washington, D.C., 1997). Source: "Georges Enesco." BAKER'S BIOGRAPHICAL DICTIONARY OF MUSICIANS®, Centennial Edition. Nicolas Slonimsky, Editor Emeritus. Schirmer, 2001. Reprinted by permission of The Gale Group. Photo by Geoffrey Landesman, courtesy of Oberlin College Library Special Collections.